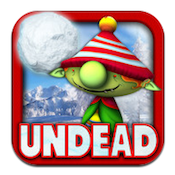 Undead Tidings iPad Game Review: Zombie-tastic Snowball Fights! Christmas may be over, but that doesn’t mean you have to stop playing holiday-themed games. Especially when those games are kinda addicting. Case in point:Undead Tidings. This iPad game was developed by Skunk Studios, Inc. In Undead Tidings, your goal is to throw snowballs at hordes of the undead. Keep the bad guys from reaching your presents, and you’ll advance in no time. Here’s some backstory: The abominable snowman has seen Santa’s list and his name is on it. So, using his secret power, the Yeti has raised an army of undead reindeer and elves to help him steal Christmas…one present at a time. The graphics are cute, and there is a great array of different characters that you get to destroy, which definitely keeps things interesting. The controls are also quite easy: just tap on the bottom of the screen, and a snowball will roll straight ahead and knock down your enemies. Hold down your finger for a bit longer, and the snowball increases in size. 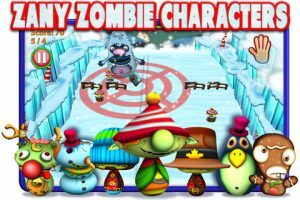 You can also use both hands to tap the screen, and send a whole barrage of snowballs across the screen to destroy the undead characters en masse. The game is quite simple, but it increases exponentially in terms of difficulty. 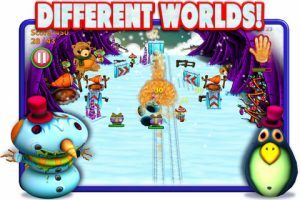 Undead Tidings is totally addictive, and equally fun for kids or adults to use as a time waster. Whether you want to make the magic of the holidays last a little bit longer, or hate the holidays and need some outlet for venting your hatred of all things Christmas, Undead Tidings is a fun way to have some serious winter fun without having to brave the whipping winds of actual winter. Check it out! Undead Tidingsis compatible with iPhone, iPod touch, and iPad. Requires iOS 4.2 or later.